2012 GIANTS Leadership Announcement Kevin Sheedy announces the GIANTS leaders for 2013. Young midfielder Tom Scully has been appointed vice captain of the Greater Western Sydney GIANTS for 2013. 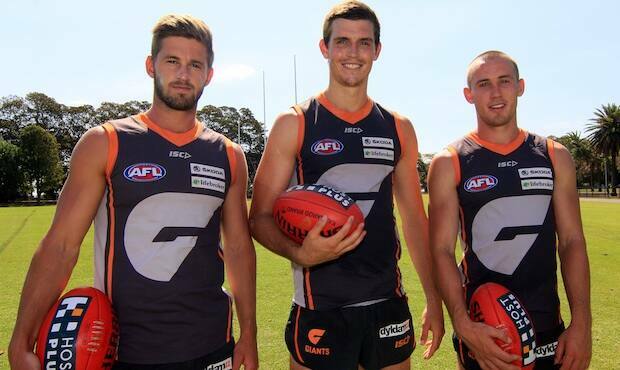 Callan Ward and Phil Davis will again be co-captains of the GIANTS, with fellow 2012 co-captain Luke Power retiring at the end of last season to take up a full-time assistant coaching role with the club. The player leadership group was selected by the GIANTS' players and coaches who were asked to nominate those players they believe best demonstrate leadership qualities. Scully, 21, played 19 games for the GIANTS in 2012 for a career total of 50 after crossing from Melbourne at the end of 2011. He averaged more than 20 possessions a game in 2012 and finished fourth in the inaugural Kevin Sheedy Medal behind Callan Ward, Toby Greene and Jeremy Cameron. Head Coach Kevin Sheedy said the club was delighted that Scully had been elevated to vice captain in his fourth year in the AFL. "The feedback from our playing group was that Tom is a true professional who is highly respected for the way he prepares himself but also does a lot of little things that often go unnoticed during games," Sheedy said. "Together with Callan Ward and Phil Davis they form a very talented leadership group that will help guide our exciting young playing group in their second year in the AFL." Scully said he was honoured to be recognised his peers and the coaching group and looked forward to the challenge ahead. “I certainly wasn’t expecting this, but I’m very humbled to be voted by my teammates as vice captain and look forward to working closely with Phil and Callan,” said Scully. “Since coming to the GIANTS I think my leadership is something which has really improved. Obviously being one of the players with a bit more experience in the squad is a unique thing in itself especially being so young myself. “I think it has helped me mature a lot more as a person and as a footballer. It’s something that I have really embraced. Setting an example through leadership is something I hope to develop over this year and in the years to coming. Sheedy said the club was also committed to developing the next group of leaders to take the GIANTS forward in the years to come. "We need to develop these young players as we continue to shape the culture and direction of the GIANTS," he said.